INSPIRE’s “Wear All Blue” Colorectal Cancer Awareness – DAY 6 with Heather Marie Matson’s boys. Colon cancer survivor, Heather Marie Matson, was diagnosed 10 months ago with stage 3 colon cancer and a horrible genetic mutation that harbors cancerous polyps inside her body. Heather shares a photo of her boys who gives her that willpower to live. “These boys make me smile every minute of every day and couldn’t be happier to have them wearing blue in my honor today and every day”, says Heather. 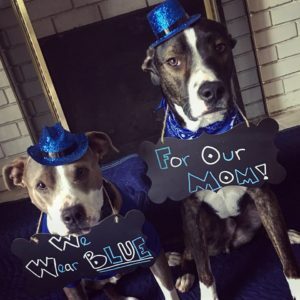 Her boys “wear blue” for their Mom. Precious. Thank you Heather and boys for sharing your “Wear All Blue” with INSPIRE and supporting the American Samoa Community Cancer Coalition in helping the people of American Samoa fight cancer. Stay strong!